Zibanejad established a career high in goals for a season Saturday when he scored his 28th in the Rangers' 5-2 loss in Minnesota. Lost in the gloom of the Rangers’ locker room Saturday night, after the conclusion of their 0-3-1 trip through Western Canada and Minnesota, was a small bit of individual success achieved by first-line center Mika Zibanejad. Zibanejad broke an eight-game goalless drought and established a new career high for himself when he scored his 28th goal of the season early in the first period. It was still a game, at that point, as Zibanejad’s goal – a crazy shot from the right wing corner boards, behind the goal line, that somehow went past Wild goalie Devan Dubnyk – tied the score 1-1. The Wild, fighting to get into the playoffs in the Western Conference, would eventually pull away and beat the Rangers, 5-2, rendering Zibanejad’s goal meaningless, to his way of thinking. The Rangers have known for weeks now – maybe months – that they weren’t going to make the playoffs this spring. But there was a sense of finality after this last multi-game road trip of the season. They dropped the first game in Edmonton in overtime, on a goal by Leon Draisaitl, set up by Connor McDavid. In Vancouver, Chris Kreider and Brendan Lemieux were both ejected in the second peraiod, and the struggling Canucks pulled away. They were a complete no-show in Calgary, in a game where coach David Quinn said the Blueshirts “caved’’ to the reality of their situation. 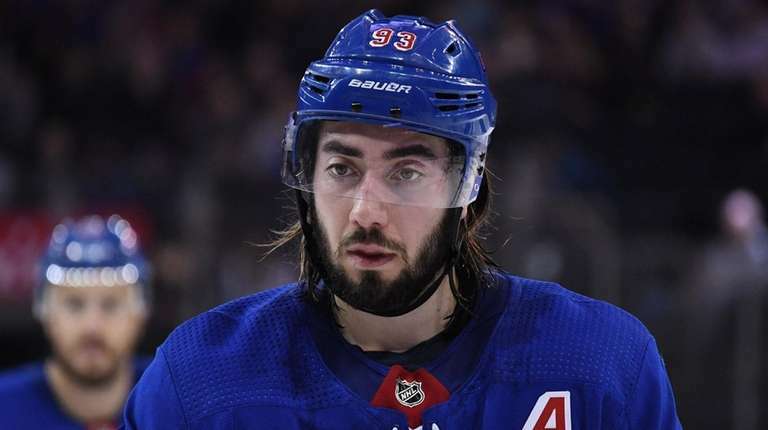 Now, with the games rapidly running out on a season that ends April 6 in Pittsburgh, all the Rangers, and Zibanejad could do was talk about staying positive and hoping for better next year. “No one’s checked out, by any means,’’ Zibanejad said. “Let’s try and finish on a high note. If we lose 10 straight here, or  straight, or whatever it would be, going into the end of the year, I don’t think anyone’s going into the offseason happy. I don’t think we’re going into the offseason happy if we win 10 straight, either, but at the same time, you can definitely have a better feeling and more of an excited feeling knowing that we were close this year, and a lot of those games – overtime losses, you just (reverse the results in) even just half of them, and we’re right in there.